FILE - The grave of a Bosnian Serb soldier. All sides are meticulous in tending the graves of the dead from the Balkan wars of the 1990s that erupted as Yugoslavia fractured. Twenty-five years ago, Croat paramilitaries attacked the village of Ahmići on three sides around the time of morning prayers, leaving one obvious escape route, where they positioned snipers to pick off Muslims fleeing the village in the now picturesque Bosnian Lašva Valley. Hasreta Ahmić, a massacre survivor, recalls with a shiver what happened in 1993 when Croat paramilitaries attacked her village and killed an estimated 120 Bosnian Muslims. As shells and mortars rained down, she said. “Everyone was scrambling for shelter, basements. The cellars were full mostly of old people and children, very young children. It was a horror. We did not have anything to eat or drink. There was neither water nor electricity. However, when it went quiet, I grabbed a bucket and ran to the stables. I milked the cow,” she said. That night her husband, Huso, guided her and their three children to the safety of a nearby forest. As he returned to retrieve his infirm parents, he saw the family home “red and glowing.” He rushed toward it but, he said, “My feet were like lead.” When he got close he realized he would never see his parents again. “I felt totally alone, collapsed and sobbed silently,” he said. 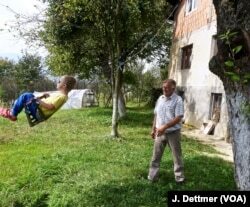 Huso Ahmić, now 72 years old, plays with a grandson in the garden of his family home, which was rebuilt after it was razed in the 1993 attack. His parents died in the blaze. They say the massacre of April 16, 1993, never leaves them. They have no contact with any Croats who were involved directly or indirectly. One of the paramilitaries had been a good neighbor and friend before the war. The Balkan wars of the 1990s left an estimated 130,000 dead, and lingering anger and resentment, along with a feeling the gods of war have not finished with the Balkans. Reconciliation has stalled, rights activists warn. 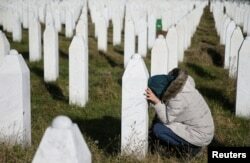 FILE - A woman visits a grave of one of her family members in the memorial center Potocari near Srebrenica, Bosnia and Herzegovina, after the court proceedings of former Bosnian Serb general Ratko Mladic, Nov. 22, 2017. A new generation of nationalists is appearing among Bosniaks, Croats and Serbs. Mostly working class and resentful about the lack of economic opportunities, the young are starting to glorify the warlords of the past. Born after the wars, these new nationalists have no experience with what carnage looks like, feels like or smells like. A plaque in a local museum honoring the dead. The Canadian Army’s Col. Remi Landry was a member of the European Community Monitor Mission in the Balkans during the war. “I’m not afraid of an armed conflict because we are living in a conflict situation already. We are not shooting at each other, but we are actually living in something called a partial peace,” said Aleksandra Letić of the Helsinki Committee for Human Rights. Aleksandra Letić of the Helsinki Committee for Human Rights bemoans an increase in nationalist rhetoric, fanned by the politicians, especially in the run-up to Bosniawide elections. “I’m afraid the country [Bosnia] could be sucked into a big social conflict, if nothing changes,” she said. 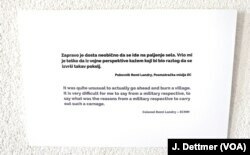 Youngsters get little accurate information about the 1992-1995 Bosnian war. The education ministries in the country’s two legal entities do not encourage joint teaching about the war. Serbia is different, up to a point, she argued. “At least in Belgrade, in Novi Sad, in the bigger towns, they have a critical mass gathered around youth organizations who are gathered around more progressive politicians,” she said. On Oct. 7, the voters of Bosnia and Herzegovina will cast their ballots for a national presidency and House of Representatives, as well as separate presidents and legislatures for the Muslim-Croat Federation and Republika Srpska. Complicating the election is that voting will take place in the Bosniak-Croat Federation without an agreed electoral law in place, which could paralyze efforts to form governments in the entity afterward and lead to suspension of crucial European Union funds. 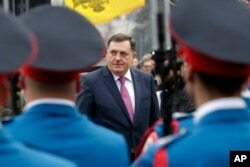 FILE - President of the Bosnian Serb Republic Milorad Dodik inspects an honor guard during a parade in the Bosnian town of Banja Luka, Jan. 9, 2018. In Republika Srpska incumbent President Milorad Dodik, who has been in power since 2010 and served previously two terms as prime minister, appears to be coasting toward re-election. Frequently, he advocates that Republika Srpska should break away and declare itself an independent state, a move that would shatter the fragile multi-ethnic peace of the Balkans. Opposition leader Branislav Borenović, president of the Party of Democratic Progress, accuses Dodik of trying to create an atmosphere that frightens people. “We are quite independent enough,” he said. He says the Muslim-Croat Federation and the Serb-controlled ministate desperately need a new generation of politicians far removed from the ethnic mindset of the past. “The current political elites are afraid of talking about everyday issues. ... They are pushing very hard emotional nationalistic issues. We have had political elites controlling for the past 10, 15 years,” he added. Borenović hopes this election will mark a turning point in both entities. But resurgent geopolitical interests and competition in the region by outside powers, including the United States, Europe, Russia and Turkey, could fuel ethnic hostility. Most ethnicities welcome renewed international attention to the Balkans, but Russia is seen by many as having an agenda that does not heal ethnic wounds and is aimed at keeping Balkan countries out of NATO. “Anyone who respects the sovereignty of Bosnia and Herzegovina and who’s not interfering in the internal affairs of Bosnia and Herzegovina is welcome. The United States is completely like that. This is our great partner and friend. 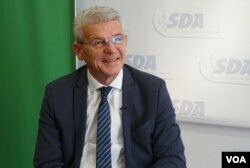 If there were no USA everything would be different here,” Šefik Džaferović, a leading Bosniak candidate for the presidency of Bosnia and Herzegovina, said. Dodik has been playing the Russian card, seen as a traditional ally of Serbian nationalism, in his campaign, and Russian officials have been happy to lavish attention on him, determined to keep a foothold in the Balkans. In contrast, U.S. and European leaders and officials have been keeping a low profile to avoid accusations of election meddling. 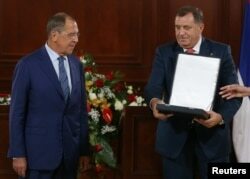 President of the Republika Srpska, Milorad Dodik awards Russia's Foreign Minister Sergei Lavrov with Order of the Republika Srpska, after their meeting in Banja Luka, Bosnia and Herzegovina, Sept. 21, 2018. Last month, Russian Foreign Minister Sergei Lavrov visited Bosnia, insisting his trip had nothing to do with the upcoming polls and denied the Kremlin is throwing its weight behind Dodik. “We never advise whom to vote for, if we’re talking about elections in other countries,” he said. And, he said the Kremlin remained committed to the Dayton Accords. Last year, the Kremlin was accused of being behind a coup plot in Montenegro to try to sabotage its joining NATO. And Western diplomats accuse Russia of meddling in last week’s referendum in Macedonia on a name change for the country, part of a bid to normalize relations with neighboring Greece. The Kremlin rejects the charge. But Dodik opponents say the incumbent clearly sees his close ties with the Kremlin as helpful in shoring up his nationalist vote.